They should be considered a collectors item only. 100%Triacetate (so silky soft). PRE-OWNED : the seaming on one of the wrists is open and one button is missing. Otherwise great condition. - Blue/red check. FITS MORE LIKE A SIZE XS. SOFT 50/50 FABRIC. LABELED A SIZE SMALL. THE COLOR IS NOT FADED. PILE LINING! BUTTON FRONT! 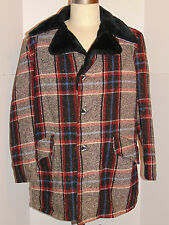 UNUSED 1950s-60s FLECK PLAID JACKET! WARM PILE LINING'. UNUSUAL COTTON FABRIC WITH PLAID PATTERN WITH FLRCKS. ARMS HAVE QUILTED LINING. BOTTOM OF COLLAR TO BOTTOM OF JACKET ALONG BACK 32". Waist 32 in. Length 44 in. Inseam 32 in. -Great condition. They should be considered a collectors item only. All in very good condition. Don't appear to have been worn much if at all.May have a small mark from sitting in storage. These do have a light musty type odor from being in an older estate. Check out this awesome vintage 60s Hawaiian shirt from Garments Ltd- super rare and collectible label.. It is made from 100% cotton, and has a fun mod Hawaiian island design, and it is perfect for your next tiki fest! This fantastic piece of Hawaiian history features a hidden seam collars, matching fabric chest pocket, and all original metal flower buttons with horizontal button holes. Size: Extra large Across Chest: 24" Shoulders: 19" Length: 28" Condition: Excellent Check your measurements- no returns exchange only. SUBWAY CAR GRAFFITI. BRIGHT GRAPHICS! NEW YORK CITY SUBWAY SIGNS. VERY BRIGHT GRAPHICS. BOTTOM OF COLLAR TO BOTTOM, ALONG BACK 33". NO MANUFACTURER LABELS OR OTHER LABELS. VERY NICE SHAPE, IT LOOKS UNUSED. Check out this awesome vintage 60s Hawaiian shirt. It is made from 100% cotton with a mod tapa cloth design. This amazing piece of Hawaiian history features, a shark fin collar with collar stays, hidden slash style chest pocket, and all original pearly cat buttons. Size: L Across chest: 23" Shoulders: 17" Length: 27" Condition: Good. Some staining around the neckline. Not obvious when worn- priced accordingly. All sizes are approximate based on measurements. Please measure a shirt that fits you well and for comparison. All sales final, exchange only. Details :Plastron - Yellow Selvage - Small Collar - Glass Buttons - Pleats accents - 4 Buttons front closure - Long Style - Side Vents with Gussets - Must-Have for the Gentleman. Fabric :100 % Cotton : Soft Flannel High Quality Fabric. Chest (armpit to armpit); 22" Unstretched & 22" Stretched. Shoulder to Shoulder; 17". Waist; 20" Unstretched & 20" Stretched. Length from Shoulder to Hem; 30". Shoulder to shoulder: 15. Fabric: cotton. Condition:: AS IS: FADING, FROM LAUNDERING. Label: see photos. SOLD AS IS. Center back under collar to hem: 23. LABEL IS FADED AND WORN. Sleeves: 4 1/2. Shirt has been cleaned and laundered. The pics speak for themselves and shows exactly what you will receive. Chest: 52" (26" Across). Shoulders: 21". Length: 31". Colour :Dark Orange and White with Iridescent Shiny Gold Bronze Dots. Fabric :100 % Cotton : Textured fabric with Dots. Details :Bold Print - Wide Collar - 1 Large Pocket - Buttons front closure. A REAL EYE-CATCHER. Vintage old stock PCA perma press men's pajamas, long leg & sleeve. New and unworn. Size B / medium, see sizing chart in pictures. Garnet and gold multi print. This is from a smoke free home, but they are an estate sale find and they do smell vintage! Not a mothball grandma smell, more like a comforting childhood smell, brings you back to time when you had no care in the world! Details :Bold Print & Colours - Button Front Closure - 1 Pocket. Colour :Light Yellow with Hot Pink - Navy Blue - Golden Brown - Cobalt Blue and Black. Fabric :100 % Cotton. Collar Size :16. Fabric :100 % Cotton : Imported Quality Fabric : Original Dutch Wax Block Prints by Hitarget. Details :Great African Tribal Print - 3 Buttons front closure - 1 Pocket - Contrasting Trims. Fabric :100 % Cotton : Finest Quality Imported Fabric. Neck size :17.5. HUNTER/ LUMBERJACK LOOK. RED/BLACK WOOL. SIZE LARGE. LENGTH 31". SLEEVES 24". Details :Great Colours - Pointed Collar - Gussets with Selvage - 4 Buttons front closure - No Pocket - Pleats Accents - Soft Flannel Plaid Fabric. Fabric :100 % Flannel Cotton : Very Soft fabric. Colour :Teal Blue - Olive Green - Orange and Burgundy. Lots of distress and holes. 6" sleeves. 19" shoulders. LOOP POLO COLLAR! SHORT SLEEVE! 1960s BEACH STYLE PLAID BUTTON SHIRT! YELLOW COLLAR, LOOKS LIKE A POLO SHIRT COLLAR WITH A LOOP BUTTON CLOSURE. 52% COTTON, 48% POLYESTER, THE FABRIC & CARE LABEL IS WORN. Color :Dark Chocolate Brown - Chocolate Brown - Light Gray and White. Reference Number :W2. AND SHIRT IS MADE IN HAWAII AND LABEL IS MISSING BY KILOHANA IN HAWAII MADE IN THE USA WOULD BE A GR EAT SHIRT FOR ANY EVENT.